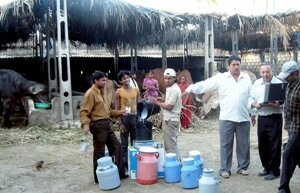 First he devised a way for India's 11 million dairy farmers to improve milk production. Now Dr Suresh Gulati of the Faculty of Veterinary Science is making milk healthier in a country where coronary heart disease is set to soar. The World Health Organisation (WHO) estimates that 60 per cent of the world's cardiac patients will be Indian by 2010, meaning heart disease will be a bigger problem there than in America. Dr Gulati has to India on a 2007 Endeavour Executive Fellowship from the Department of Education, Science and Training. He has been working in the village of Kadodra in Gujarat, where milk from the local Jaffarabadi buffaloes has an exceptionally high milk fat content of 8 per cent. By feeding the buffaloes 'good fats' in the form of conjugated linoleic acids (CLA) supplements, "we were able to reduce milk fat content by as much as 30 per cent and increase the levels of healthier fatty acids," says Dr Gulati. "There is a world-wide demand for dairy products, infant formula and functional foods with higher levels of good fats such as omega-3 and CLA which are associated with health benefits," he says. Previously Dr Gulati worked with the same farmers to improve milk production in a country where the vast majority of village dairy farmers are women tending just one or two cows or buffaloes for their livelihood. "Because most of the nutritious grains go to feeding India's large human population, dairy cattle are often left with a diet of just straw and stubble. This sort of diet lacks nutrients and energy necessary for optimal milk production," explains Dr Gulati. With the assistance of the Indian Dairy Board, who assisted and hosted the project, he devised a system of turning low cost oil seed by-products such as sunflower and canola meal into feed supplements for cattle and buffalo, increasing milk production by a litre of milk a day per animal. That translates into about 33 Australian cents extra profit per animal - "a tremendous proposition for India's dairy farmers," he says. A welcome side-effect was that calving rates also increased. Dr Gulati is proposing some work in this area as well, "but that's a story for another day when we do the research," he says. Dr Gulati came to Australia almost 35 years ago. Originally from New Delhi, he studied at the University of New South Wales and worked for many years at the CSIRO before joining Sydney University. He says he still feels a strong emotional attachment with his birth country. "I do feel a pull towards India - very much so. And because I speak the language, it makes the work that much easier," he says. Dr Gulati is heading back to India next week (October 4-7) to present his latest research findings at the Tropical Animal Nutrition International Conference (Tropnutricon-2007) at the National Dairy Research Institute, Karnal, in the northern state of Haryana.